It's all here! Learn how to smoke turkeys, turkey breasts, turkey legs, turkey thighs, and even turkey wings. Learn about brining turkeys, marinating turkeys, seasoning turkeys with dry rubs, trimming turkeys, and choosing the best turkey for your smoker or grill. Learn to cook turkeys in electric smokers, gas grills, charcoal smokers and even in turkey fryers, both the deep fat fryers and the new oil-less infrared Big Easy turkey fryer. Turkey Smoking Tips - Tips and techniques that will make your turkey smokin' easier. More Turkey Smoking Tips - More tips and info for making the best smoked turkey possible. Smoked Thanksgiving Turkey - One of my recipes that I used for one Thanksgiving turkey I smoked. Grill Smoked Turkey - You can smoke turkey on a grill, too. Smoked Wild Turkey - Are you a turkey hunter? Try smoked wild turkey breasts. They are excellent! Smoked Turkey Breast - Smoking turkey breasts is an easier option to smoking the whole bird. Great if you're a white meat lover, or prefer the lower calorie, lower fat white meat for healthy eating. Wet or Dry Turkey Rub - This rub recipe can be used dry, or mixed with vegetable oil to use as a wet rub. Turkey Brine Recipes - A few of my favorite turkey brine recipes. Making Turkey Brine - Instructions for making turkey brine that works best. Boiling the salt water first makes it permeate into the turkey flesh more efficiently. Super Smoked Turkey Legs - Fun recipe for smoking turkey legs. Reheating Turkeys - Tips for reheating a smoked turkey. Turkey Tutorial - Smoked Turkey, the Turkey Smokin' Tutorial. This one explains the process start to finish, and makes use of a lower smoker temp for a deeper smoke flavor. Char Broil Big Easy Fryer - Char Broil's infrared turkey fryer works really well. This oil less turkey fryer saves you money, too. Smoking Cut Up Turkey - Benefits of smoking a turkey that's been cut up, opposed to smoking it whole. 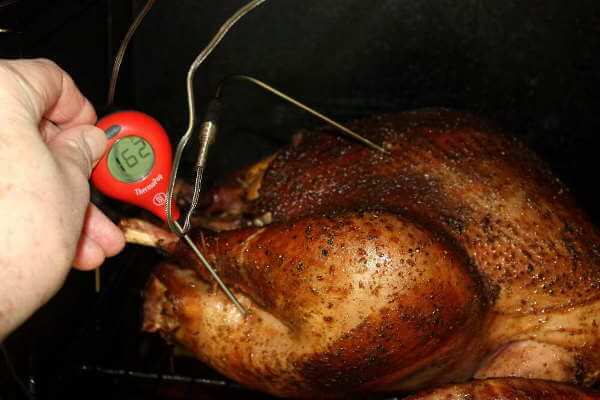 Water Smoker Turkey - Should you use the water pan filled with water or flavorings? Cooking Half of a Turkey - Sometimes a whole turkey is just too much. Have the butcher cut your frozen turkey in half for just the right amount. Electric Smoking Turkeys - Will an electric smoker do a good job of turkey smoking? Smoking Turkey Weber Smoker - The Weber Smoky Mountain Cooker is the best vertical charcoal water smoker around, in my honest opinion. See how it's used to make ultimate smoked turkeys. Grilling Turkey Weber Kettle - Weber Kettle grills, used with the indirect method of grilling, cook up some pretty awesome turkey too! Gas Grill Turkey - Gas grills can be used with great success when it comes to turkeys. Apple Turkey - Apple juice flavors turkeys nicely. Teriyaki Wings - A big sized appetizer, or an interesting main course. Try Turkey Wings. Electric Smoker Turkey Recipe - Electric smoker turkey smoking is one way to go. Turkey Brining Containers - The best thing to brine turkeys in is an insulated water cooler...the perfect shape and size. And it keeps turkeys cold! Turkey Done Temperature - When do you take that turkey out of the smoker or grill? If you go by internal temperature, you'll always have turkey at its best.